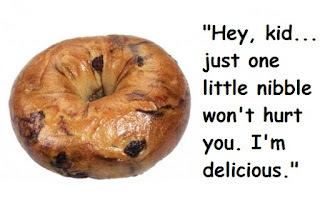 Statism is like a very-expired, contaminated cinnamon raisin bagel. How do I know? Because I have experienced both. Once upon a time, the girl I was married to worked in a nursing home. She would often bring home expired food that was being tossed out. At some point, she brought home a package of cinnamon raisin bagels. I didn't ever get a real lunch break at my job, so I would often just grab something I could munch if I got hungry. (I still can only eat one actual mean per day.) One day, rummaging around in the back of the refrigerator for "lunch food", I stumbled across this bag of bagels. Yummy! I took it to work and tossed it on the shelf where I usually put such things. That day, a little while after "lunch", I started not feeling well. Not nausea, but dizziness. It passed. The next day, not long after "lunch" I got hit with the most severe dizziness I have ever experienced. I couldn't stand. I couldn't sit. I ended up lying flat on the floor upstairs, out of sight of customers, gripping the carpet (the shop was previously a house and had semi-shag carpet) while my boss complained at me for doing so. I told her she didn't have to pay me for the time I couldn't work, but that wasn't the issue as much as was my inconveniencing her by making her have to stay at the store until I recovered. As I lay there trying not to fall sideways, or up, I remembered how I had felt the day before, not long after I ate the bagel. I connected the dots and realized the bagels had probably grown some sort of nice fungus which was affecting me. As soon as I expressed this to my boss, she tossed the remaining bagels in the trash. It took a couple of hours, but the dizziness passed. I dug the bagels out of the trash and checked their "best by" date. They were only a year or so out of date. Maybe I should have presented them to a pharmacologist- I might have discovered an awesome new drug. But I didn't think of that at the time. Anyway, this is similar to statism. It looks delicious. It passes the smell test for almost everyone. But it screws with your brain once you internalize it, because it contains toxins you can't easily detect. Those of us who don't swallow it watch those who have done so flailing around, unable to do the simplest things for themselves. But they don't even realize how silly they look, or how helpless they are. If only statism wore off after a few hours like bagel fungus does. This blog, like all of KentforLiberty.com, is reader supported, and probably causes dizziness only rarely.